It is important to understand that the variables involved in the development of a bite response are vast and many. Therefore it is really not possible to diagnose an infestation of bedbugs from bite symptoms / morphology alone. This document aims to outline a few of the variables that have been seen in recent years. It must also be stressed that not every bite you have will defiantly be from a bedbug, if you get a single lone bite and nothing for months and months it may just be a something unrelated to bedbugs. Although they might be your most obvious symptoms they are the worst diagnostic tool you can focus on. The most common myth with bedbugs is that they always produce 3 bites in a row, often called breakfast, dinner and lunch. While this does occur with some people it is not the case with all people who respond and is therefore not an accurate diagnostic of bedbug activity. Other insects which are known to often bite in rows include fleas. Bedbugs also feed every 3 – 7 days so if you go longer than this between activity it is a reasonable indication that bedbugs may not be the cause. Some people assume that because bedbugs can go long periods of time without feeding that they will do so in an occupied room, this is not the case and when food is available bedbugs will always take the opportunity to feed. Will you react at all? 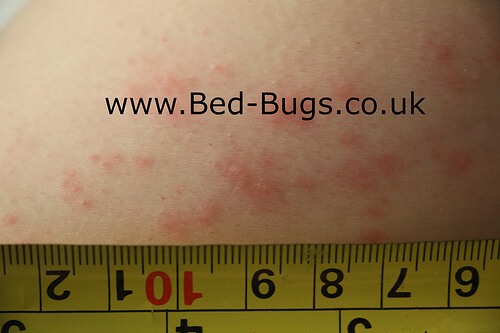 Some people never respond to the bites, they can live unaware of the fact that they have bedbugs until they seen one or find the signs that they have been present. It is believed that this figure is as high as 60% of all exposed people and accounts for the main reason why some people seem to get bitten while a partner in the same bed is bite free. This is the most common reason for an infestation going undetected in a hotel room, if no-one complains it may not get detected for a very long time. Some people respond immediately upon contact with a bedbug while others can take up to 14 – 21 days to develop a reaction. This is very much a factor of your own immune system and if your body perceives it as a threat. It is not uncommon for someone to respond quickly after a previous encounter with bedbugs as the body learns that bite response can be a good early warning signal. The more severe the reaction to bedbugs the faster the response will occur. Are some bites more severe? Yes some people have an extreme reaction to bedbugs and develop what is termed a bullous eruption, a severe reaction which swells and appears to be like a blister while others report nothing more than a red area that fades after a few minutes. You may also find that you skin responds differently in different parts of the body, as a rule try to avoid bites on the hands, feet and face as they tend to react the most. If you develop bites that develop into blisters within a few minutes seek medical attention immediately. Sometimes the bites itch and sometimes they don’t, why is that? Again our bodies respond in different ways at different times. Bites are more likely to itch if you are over heated such as in a warm bath or shower, during exercise or in a warm car. They can also itch more if your skin is dry or exposed to harsh conditions. You should avoid over chlorinated water such as swimming pools and body lotions with alcohol in them. 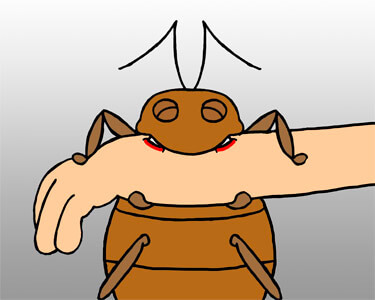 It is not uncommon for people to report increased itching after an encounter with bedbugs; the skin just seems to become more sensitive to things. How long will a bite last? The duration of a bite will depend mainly on your body’s ability to heal itself; if a cut or nick would heal quickly then you are more likely to have bites that clear quickly. If you scratch a bite then it effectively becomes an open wound on your skin and is susceptible to secondary infections, if left unscratched a bedbug bite from a normal reaction will usually heal without an scaring. If you have bullous / blister type reactions seek medical attention as soon as possible. The image below is a few days after 2000+ bites. Does the environment play a role? Yes it can play a significant role. The more polluted the environment the more likely you are to react to bites. This is because a bite is basically a small puncture wound in the skin, just the same as a cut or scratch will react more in a polluted environment due to your body’s immune response the same will occur with a bite. It has even been reported by numerous people that a change in environment or regular travel pattern has coincided with a sudden response to bites and the uncovering of some advances infestations. Yes the more stress you are under the more likely you are to respond to bites. It’s really your body’s way of telling you mind that something is wrong and that you need to stop and look for the cause of the problem. Although it is difficult to not obsess over bedbugs when you have a problem but it can play a massive role in some peoples infestations. It may be that your body is still reacting to something in the environment or it could be that something else is actually causing the problem. Some people with prolonged exposure to bedbugs develop a sensitivity to the material that makes up their skins, chitin. As this is a common component of most insect skins you can become hyper sensitive to it, almost as if your body wants an early warning signal for potential infestations. The problem is that this is a common material and can even be used as filler for food products and supplements (non insect derived of course) but taking products containing chitin can result in bite like reactions. It is also possible that other insects such as pscocids or carpet beetles can start a “bite like” reaction even though they do not generally walk on people and never bite people. If you still have an issue please see our Mystery Bite Pack Service for further diagnostic information. Again environment, stress and many factors can result in an old bite flaring up. I have even seen some people just think about bedbugs and bites appear. I have read about bites appearing in threes but I usually only get ones or two’s, why is that? Although some people report the classic “breakfast, lunch and dinner” bite patterns it is not something that everyone gets. Although there is no scientific data on the subject it is safe to assume that if a bedbug is able to get enough food from a single piercing then it will not feed again and will return to its refugia to digest the meal. If it is unable to get a full meal due to blood clotting, difficult skin to penetrate or some other factor then it may need to pierce the skin again. In which case it is safe to assume that it is likely to bite again in a close cluster. In the numerous feeding experiments I have conducted I am yet to witness more than a single piercing event from a single bedbug during a feed. I sometimes feel a pin prick like sensation can that be bedbugs? Generally people report that bedbug bites cannot be felt and it is certainly my experience from feeding in the lab in low numbers. However I have noticed that when I have spent time in heavily infested locations I often get a needling sensation on my skin for hours afterwards, I have also noticed it in properties where inappropriately high levels of insecticide have been applied or where layers of insecticide have been applied without any removal. It is unlikely that any prickling sensations are directly due to bedbugs but it can form part of your bodies early warning signs of them being present. In some exceptional circumstances people have used this response as a quick evaluation of if an area has bedbugs, it does not replace a thorough inspection but I have seen it used to encourage further inspection to eventually find samples. After treating for bed bugs my skin felt a little “crawlie and tingley” why is that? Some people who are more sensitive to chemicals report this as a symptom of exposure. This is one of the main reasons why appropriate protective equipment must be worn, especially with store bought products. Prolonged feelings of things crawling on your skin can be a symptom of other medical conditions and should be discussed with a medical professional if it persists for more than a few days. How can I tell what type of reaction I get to bedbugs? 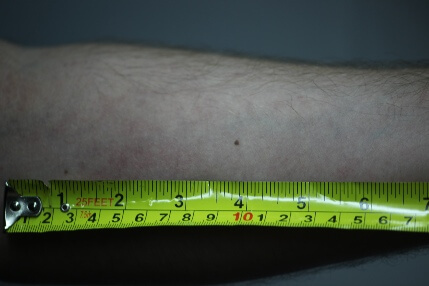 Although this is not something that we would recommend the only way to establish exactly what you reaction is involved performing a series of experiments comparing the difference between known bedbug bites on your skin and small punctures made with a blood sampling needle. You should not attempt this if you have a more aggressive or irritating bite response. I keep getting bitten but can’t find any signs of bedbugs, why is that? Unfortunately bites alone does not equate to bedbugs, there are far too many other things that could be an issue to think this way. If you keep getting bitten and can’t find any signs then you need to consider other possibilities. I would suggest that if you get to 20 bites a night or 50 bites in total and cannot find any faecal traces then it is unlikely to be bedbugs if you feel you have searched thoroughly everywhere. Getting over heated such as a hot bath, shower or exercise. If you need to maintain a good exercise regime switch to swimming in low chlorinated water and definitely not sea water. Dry skin either through exposure to the elements or dry air, try to keep well moisturised and hydrated. Excessive application of body creams that contain alcohol, strong colours or fragrances. Exposure to high levels of environmental pollution often associated with areas of high hydro carbon pollution such as air ports. This is a working document; please do not repeat post elsewhere but link back to this page as I will continue to edit it as the source. Please feel free to post comments or further questions below but please try to keep them related to this document, if you want to discuss your specific case please start a new thread to avoid your question being over looked.